Fishing boat was involved in a rescue last month. The U.S. Coast Guard came to the aid of a fishing boat in danger of sinking early Monday morning. The FV Capt. Bligh was “was taking on water and needed help” while in 15- to 20-foot seas 28 miles southwest of Martha’s Vineyard, Petty Officer Nicole Groll told The Times. The crew reported their generator failed, Groll said. A Jayhawk helicopter from Air Station Cape Cod lowered a dewatering pump to the crew, enabling them to keep the vessel afloat, she said. The cutter Sanibel from Station Woods Hole then escorted the Capt. Bligh into Buzzards Bay, where it was met by a tug and brought into New Bedford Harbor, she said. The Capt. Bligh was the good Samaritan vessel that came to the aid of the FV Mistress, which capsized and sank early New Year’s Day morning. The crew of the Capt. Bligh was able to rescue Tim Diaz, the only survivor of the Mistress. Oscar Diaz, Tim’s father and the owner of the Mistress, and fisherman John Ansay died in the tragedy. The Capt. 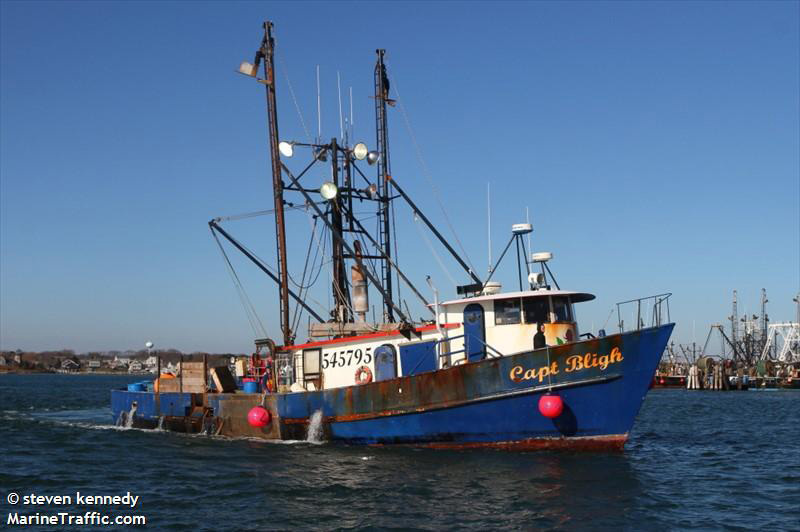 Bligh is a 68-foot steel-hulled commercial fishing vessel homeported at Cape May, N.J., according to NOAA records.